Any real estate CRM (customer relationship manager) worth the acronym will have intact some sort of email communication tool. So the idea of engaging a separate email marketing engine may not be top of mind for those already invested in a robust, prospect-to-close CRM. However, smaller firms and marketing-savvy agents, or those who may not like the email capabilities of whatever enterprise system their company installed, may be interested in TinyLetter, a simple, refined and very capable Web-based email marketing application. Email newsletters remain powerful components of any agent’s marketing mix. Your previous clients, prospects, friends and colleagues should all be on your list and receiving something at least twice a month. When it comes to reaching out via email, you don’t have to overthink it, which is what tends to pull so many agents into marketing quagmires. And that’s what makes TinyLetter so terrific: its ease of use. TinyLetter is made for people with ideas, not just people with something to sell. The interface is simple and built for writers; it’s not bogged down with analytical metrics and open rates and vexing click-through percentages. TinyLetter encourages simple messaging. Yes, you can add images and links, but you’re not presented with a visually challenging compose screen that defaults you to code or favors media-heavy communications. TinyLetter knows that text-based messaging still has the most impact for nonretail brands. Even the more technical aspects of launching and managing email newsletter are made easy with TinyLetter. 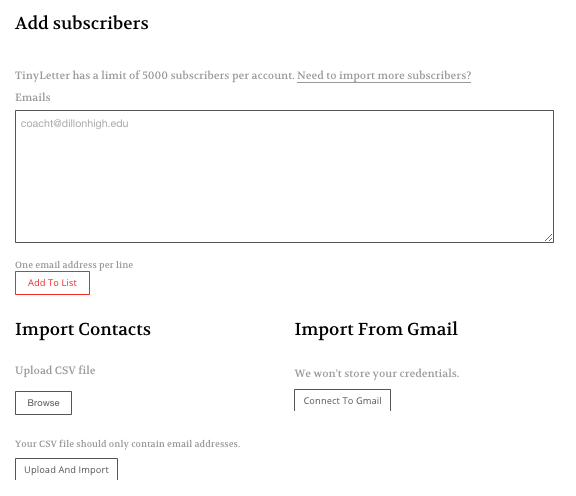 The subscribe page that you can embed on your website is simple to design and just a matter of copying and pasting when it’s ready to go. 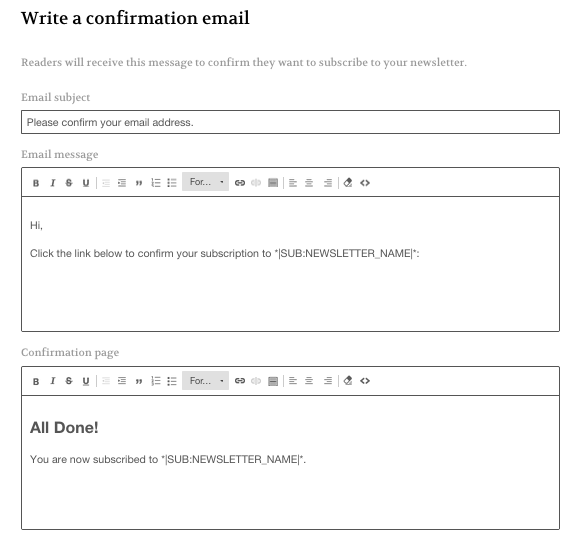 You can also customize your confirmation email and unsubscribe links. All of this is done via the “design” link, which is part of the main menu of features. To view a subscriber’s reading habits, just click on their name. Metrics presented are total opens, unique opens, total clicks and unique clicks. If they seem uninterested after a while, just remove them. Remember, subscribers who never open your message bring down your readership percentage. Don’t be proud of your subscriber count; be proud of your opens and clicks. That means people trust what you send them. The menu gives you a clean look at sent messages as well, from which you can resend a successful letter and view overall metrics for that message. 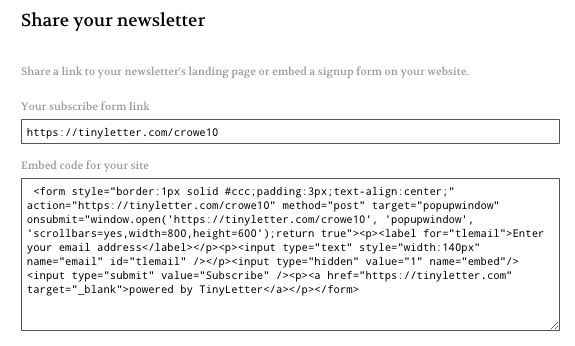 One very slick component of TinyLetter is the capability to send a message without having to log in. Create your message in another email client and send it to the custom address supplied for you in your TinyLetter profile. It automatically routes the letter to your subscriber base. 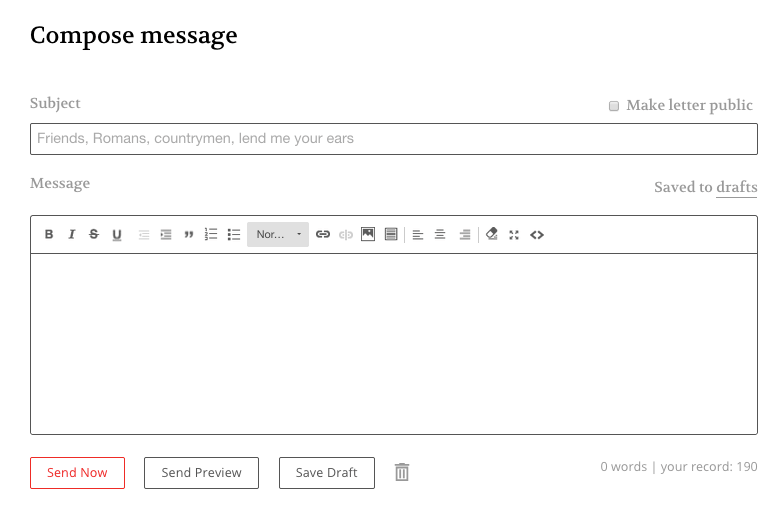 TinyLetter integrates social media via Twitter cards. When your message is sent to Twitter, you’re provided a number of visual options for how it will appear in your followers’ feeds. This is a great way to earn new readers. You can also send out your subscribe landing page and create more shareable content. 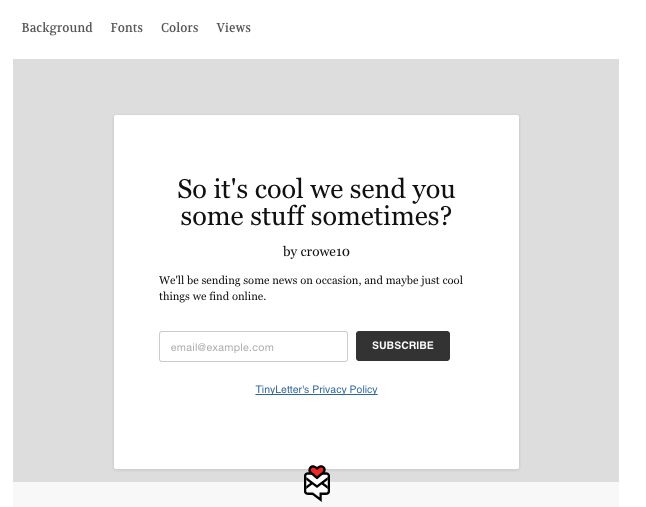 TinyLetter was developed by the crew behind MailChimp, so you know that user interface and message authenticity drove its development. And, yes, it’s free. To repeat, email marketing is not dead. Not by a long shot. Overly complex emails embedded with large image files and preceded by poorly constructed subject lines, however, are indeed ripe for burial. If you use TinyLetter, congratulations; your email marketing strategy will remain among the living. Do you use TinyLetter? What do you think? Leave a comment and let us know!